Saturday after work, Elizabeth worked hard on her carrot buckets. The earth in them was mostly frozen, so she had to chip it out in order to get enough out of the buckets so she could stack them securely in the garden shed. She put the soil into the wheelbarrow and moved it over to the black earth pile for the winter. When the spring comes, it will make a fine lookout point for me to watch goings on from. Must make sure Elizabeth doesn’t catch me there, though. It annoys her when I snooze in her dirt pile. Funny thing. I can always tell when something is going to happen around here. There’s always a flurry of activity for no apparent reason. Elizabeth should have finished with the carrot buckets ages ago. She’s been having a lot of trouble with her back, though, and they are heavy to lift so, she’s been putting the job off. The fact that she worked so hard to get them all put away on Saturday evening… well, I just got the feeling there must be something about to happen. And I was right. It happened later that night. Sunday morning, Elizabeth came out to take me for my morning walk. But it took her a bit longer than usual to get to my house. She had to shovel her way over! She opened the door to my run and I was so excited about going for my walk that I nearly got away before she got my leash fastened. I fairly flew toward the driveway. I almost choked as I came to the full length of the lead. 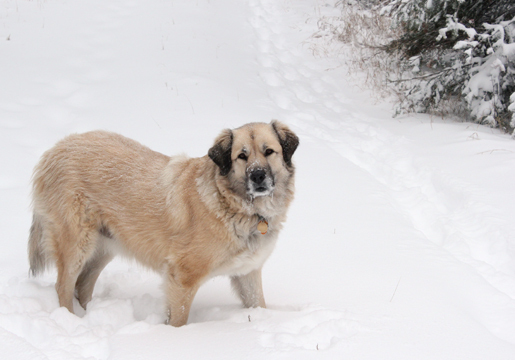 Elizabeth wasn’t as enthused by the snow. She was being very careful of where she put her feet. Two-leggers’ paws don’t work as well as ours in the winter, even though they wear different paw covers on them that are specifically for winter use. Oh. Slow. Sorry <cough, cough>. 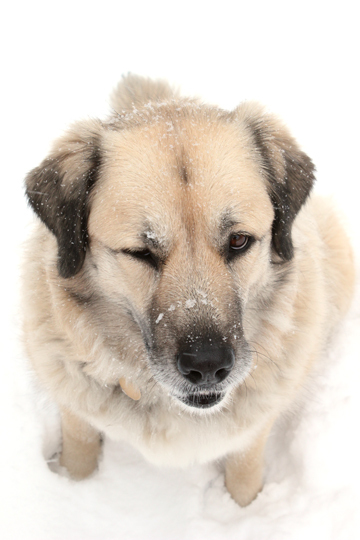 I thought you said Snow…. I guess all that shovelling tired Elizabeth out, ’cause we didn’t go very far on our morning walk before she started wheezing. She says her lungs don’t like cold wet air much, and they rebel. But I managed to convince her (a few well placed nips are all it takes) to take her camera later in the day, and I guarded her while we did an off-road photo shoot. 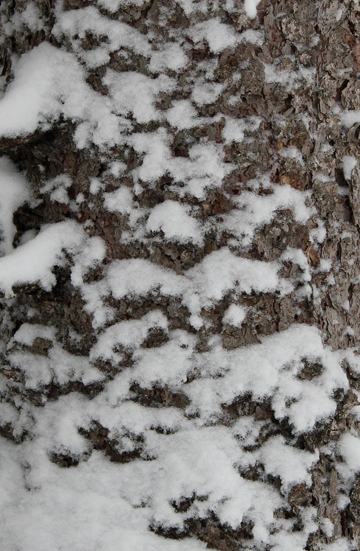 We saw lots of the same things we always see on our walks, but somehow, the snow makes them all look so different. Take a look and tell me I’m wrong for loving winter so much. 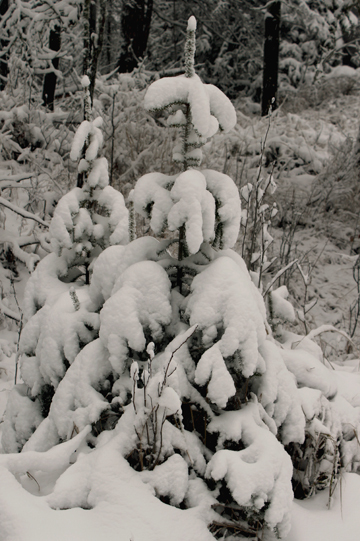 Look at how the snow blankets the baby Spruce trees to protect them from colder temperatures that are coming. 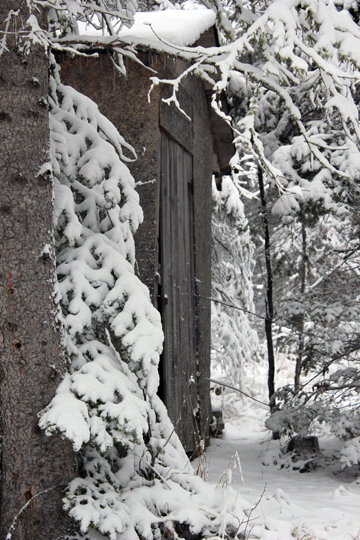 There’s almost enough snow to make our snowshoe trail – but not quite. Funny. 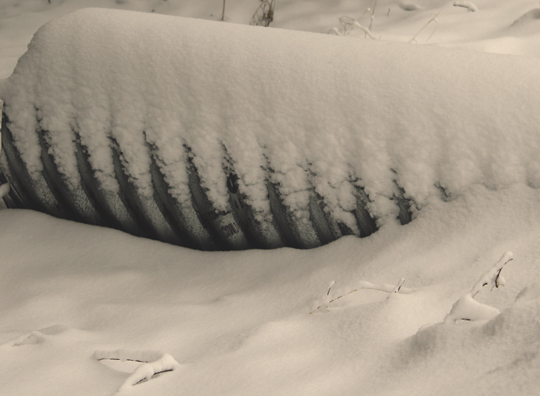 The Spruce babies look cozy, but this culvert sure looks cold! 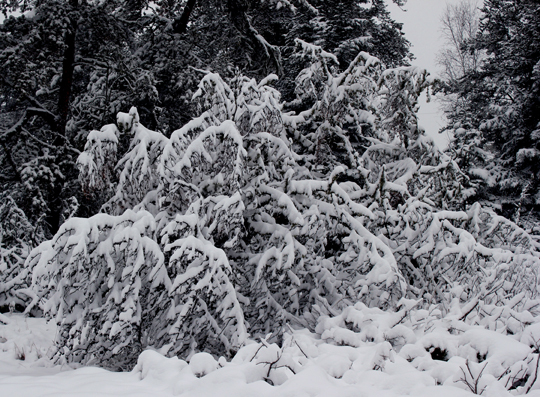 Many of the big Spruces look like they’ve sprouted snow feathers. Beautiful, isn’t it? I love the snow! Time we turned around, Elizabeth. The sun goes down early now! 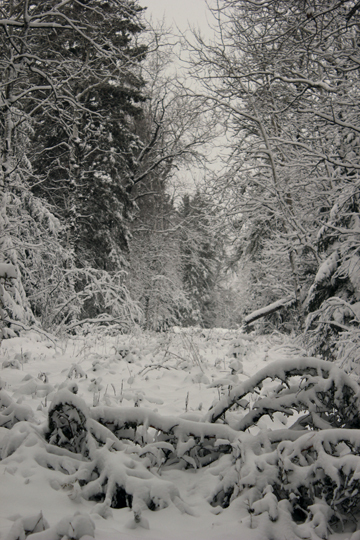 It’s still snowing out, but not so hard that our trail is covered. When we got back to our gravel path, which isn’t looking very gravelly now, Elizabeth let me off the lead. I just had to stop and take it all in. So much wonderful white fluffy stuff! Elizabeth caught up to me. I let her. I didn’t want her to get lost. Elizabeth used to have a horse. This was his house. It looks pretty in the snow, too. You must be careful in the snow! Typist hates driving in it!! Nope we get an inch and the entire country falls apart. It is a shame we don’t do proper snow – I can’t help but feel if we did the snow tyre, chains etc it wouldn’t be quite so scary!! Maybe typist will just have to stick her head out the window and forget about her worries! That does look lovely, Stella! The trees look beautiful with a covering of snow. We had some snow at the weekend, but it’s all gone again. It’s been coming and going for a few weeks here, too, Clowie. But now I think it’s here to stay! I’m sorry yours is so elusive. Weather can be a wicked tease, can’t it. 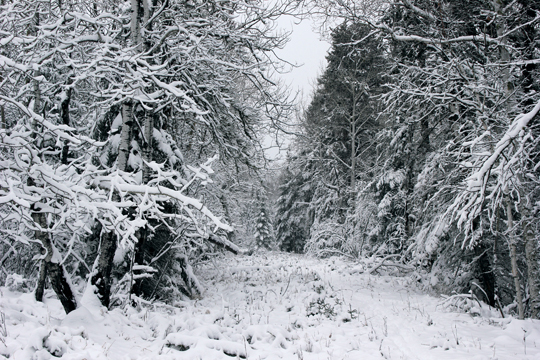 WOW, beautiful snowy pictures! 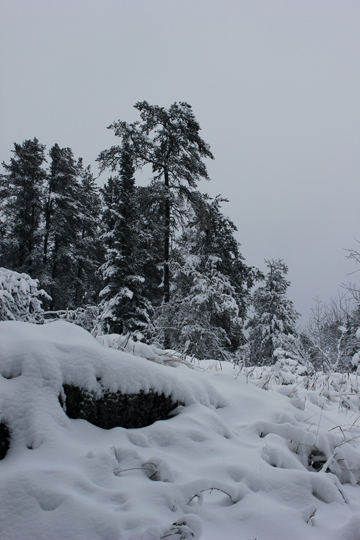 We have already had snow here too, but not as much as what you received. 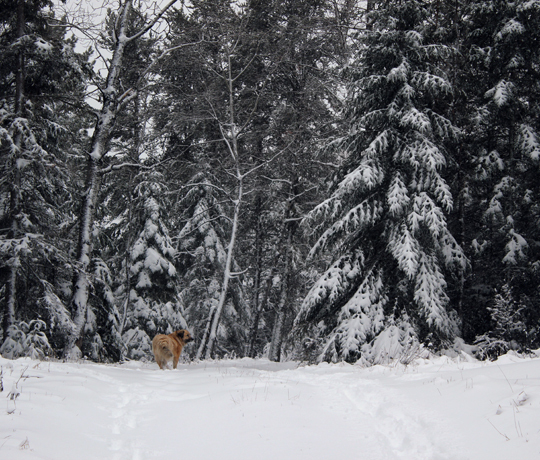 Doggies just love the snow and I love how beautiful the photographs we can get of them playing in the snow! She is doing fine, as the pics she posted are AWESOME!